The Men's 10,000 metres event featured at the 1999 World Championships in Seville, Spain. The final was held on 24 August 1999. These are the official results of the Men's 110 metres hurdles event at the 1999 IAAF World Championships in Seville, Spain. There were a total number of 42 participating athletes, with six qualifying heats, four quarter-finals, two semi-finals and the final held on Wednesday August 25, 1999, at 20:25h. 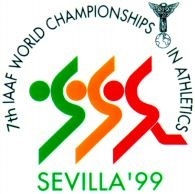 The Men's 20 km Walk at the 1999 World Championships in Sevilla, Spain was held on Saturday 21 August 1999, with the start at 18:45h local time. These are the official results of the Men's 400 metres event at the 1999 IAAF World Championships in Seville, Spain. There were a total number of 48 participating athletes, with six qualifying heats, four quarter-finals, two semi-finals and the final held on Thursday 26 August 1999 at 8.45 pm. These are the official results of the Men's 400 metres Hurdles event at the 1999 IAAF World Championships in Seville, Spain. There were a total number of 50 participating athletes, with seven qualifying heats, two semi-finals and the final held on Friday 1999-08-27 at 21:00h. The Men's 4x100 metres relay event at the 1999 World Championships in Athletics was held at the Estadio Olímpico de Sevilla on August 28 and August 29. The Men's 4 × 400 metres relay event at the 1999 World Championships in Athletics was held at the Estadio Olímpico de Sevilla on August 28 and August 29. After Antonio Pettigrew later admitted to taking banned substances, the winning US team was retrospectively disqualified. The first person to cross the finish line was Russian German Skurygin. Unlike the other DQ's listed for form violations (loss of contact or bent knee), his was announced two years later. He was disqualified for a doping violation, one of the first for a string of doping violations by athletes in the charge of his coach Viktor Chegin. Skurygin was removed from the results all athletes behind him advancing one place. Skurygin died of a heart attack 9 years later at age 45. These are the official results of the Men's Decathlon competition at the 1999 World Championships in Seville, Spain. There were a total number of 25 participating athletes, including nine non-finishers. The competition started on Tuesday August 24, 1999, and ended on Wednesday August 25, 1999. The event was one of the permit meetings of the 1999 IAAF World Combined Events Challenge. The official results of the Men's Marathon at the 1999 World Championships in Seville, Spain, held on Saturday August 28, 1999. These are the official results of the Women's 110 metres hurdles event at the 1999 IAAF World Championships in Seville, Spain. There were a total number of 42 participating athletes, with six qualifying heats, four quarter-finals, two semi-finals and the final held on Saturday August 28, 1999, at 20:05h. The official results of the Women's 20 km Walk at the 1999 World Championships in Sevilla, Spain, held on Friday 27 August 1999, starting at 18:50h local time. These are the official results of the Women's 400 metres Hurdles event at the 1999 IAAF World Championships in Seville, Spain. There were a total number of 28 participating athletes, with four qualifying heats, two semi-finals and the final held on Wednesday 1999-08-25 at 20:45h. The Women's 4x100 metres relay event at the 1999 World Championships in Athletics was held at the Estadio Olímpico de Sevilla on August 28 and August 29. The Women's 4 × 400 metres relay event at the 1999 World Championships in Athletics was held at the Estadio Olímpico de Sevilla on August 28 and August 29. These are the official results of the Women's 5000 metres event at the 1999 IAAF World Championships in Seville, Spain. There were a total number of 44 participating athletes, with two qualifying heats and the final held on Friday 27 August 1999 at 21:15h. These are the official results of the Women's Discus Throw event at the 1999 World Championships in Seville, Spain. There were a total number of 31 participating athletes, with the final held on Monday 23 August 1999. These are the official results of the Women's Javelin Throw event at the 1999 World Championships in Seville, Spain. There were a total number of 30 participating athletes, with the final held on Saturday 28 August 1999. The Women's Marathon event at the 1999 World Championships in Seville, Spain was held on Sunday August 29, 1999.